The anti-corporate movement has made remarkable headway in the past two years and the champions of unrestrained big business have been forced on to the back foot. Not long ago it would not have occurred to them to justify their actions. Now, thanks to the impact of global protests and the No Logo argument, they feel obliged to defend their position. In its 8 September issue, the British weekly The Economist ran a cover story titled ‘Pro Logo. Why brands are good for you’ with a design parodying Naomi Klein’s best-seller. It was a feeble response, but it was also, just three days later, simply irrelevant. The awful events of 11 September seemed for a while to reduce almost everything else – not least design – to the level of redundant doodling. What did the pros and cons of branding matter when the future of the free world was suddenly at stake? With so many missing and dead, it felt trivial and insensitive to talk about anything else. In the US, the AIGA cancelled its ‘Voice’ conference, an event which had boldly promised the convergence of ‘activists, politicians, utopians, rabble-rousers and graphic guerrillas’ on the nation’s capital. * A special tie-in issue of Adbusters, with the rubric ‘Design Anarchy’, caused disquiet among some shell-shocked American designers whose appetite for ‘anarchy’ had understandably vanished as the twin towers came crashing down. 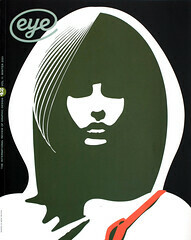 Another significant design casualty of the post-11 September effect was the latest issue of Sphere magazine, published annually in New York by Worldstudio Foundation (www.worldstudio.org). ‘Wish You Were Here’ is wrapped in 21 perforated postcards by assorted artists and designers, each of whom picked a theme, created an image and composed a brief text. So we have Paul Elliman on bicycle protests, James Victore on the rampant oil industry, Joshua Berger and Plazm on the electric chair, Milton Glaser on Africa’s AIDS epidemic and David Byrne, of all people, on the morning-after pill. And the proposed recipient of these scathing postal reminders to try harder? President George W. Bush, beneficiary of a ‘sham election’, who is pictured by graphic artist Shawn Wolfe on the cover, against a wobbly stars and stripes backdrop, with blood flowing from his sightless eyes. ‘Wish You Were Here’ was conceived way back in January on the eve of Bush’s presidency. It was just bad luck that it was bulk-mailed on 29 August and that issues were still hitting designers’ desks at a time when the US was reeling from shock and Americans were experiencing a patriotic surge and rallying around Bush, felt by many to have risen impressively to the occasion. ‘Your organisation is weak, disgusting, and anti-American,’ blasted a former paratrooper, turned designer, in a message to Worldstudio. ‘If you do not like our President, our freedoms and our culture, I suggest you move to some place more to your liking. Afghanistan?’ fumed a female art director. Someone sent a photo of a defaced Sphere floating in a toilet bowl. It was a telling illustration of the way in which the immediate emergency eclipses all other considerations. Do the designers who responded with such fury – though many others were supportive – really oppose calls to house the homeless, stamp out illegal Western slave-trading, or give international aid to help improve education in the poorer nations? Despite the uproar, Mark Randall, editorial and creative director (with founder David Sterling), says that Worldstudio stands by its initiative. However, the sponsor, Sappi, which saw and approved the publication before it went to press, has asked the foundation not to distri-bute further copies, given the climate in the US. Clearly, it suits some to blur the distinction between outrageous terrorism and legitimate protest, to claim that dissenting voices are ‘unpatriotic’ and that there is only one acceptable stance. Italian prime minister Silvio Berlusconi says there is a ‘strange unanimity’ between Islamist terrorism and the anti-corporate activists. The Financial Times claims that 11 September finished the protest movement at a stroke. This is nonsense. The feeling, especially among Americans, that everything has changed and that dissent is no longer appropriate is a short-term reaction to traumatic shock. The global iniquities and inequalities being challenged in a document such as ‘Wish You Were Here’ have not gone away. Nor has the need for graphic commentary and protest diminished. As we head into an alarmingly uncertain future, it has increased.